Deep reinforcement learning GPU libraries for NVIDIA Jetson with PyTorch, OpenAI Gym, and Gazebo robotics simulator. Want to be notified of new releases in dusty-nv/jetson-reinforcement? In this tutorial, we'll be creating artificially intelligent agents that learn from interacting with their environment, gathering experience, and a system of rewards with deep reinforcement learning (deep RL). Using end-to-end neural networks that translate raw pixels into actions, RL-trained agents are capable of exhibiting intuitive behaviors and performing complex tasks. Ultimately, our aim will be to train reinforcement learning agents from virtual robotic simulation in 3D and transfer the agent to a real-world robot. Reinforcement learners choose the best action for the agent to perform based on environmental state (like camera inputs) and rewards that provide feedback to the agent about it's performance. Reinforcement learning can learn to behave optimally in it's environment given a policy, or task - like obtaining the reward. In many scenarios, the state space is significantly complex and multi-dimensional to where neural networks are increasingly used to predict the best action, which is where deep reinforcement learning and GPU acceleration comes into play. With deep reinforcement learning, the agents are typically processing 2D imagery using convolutional neural networks (CNNs), processing inputs that are an order of magnitude more complex than low-dimensional RL, and have the ability to learn "from vision" with the end-to-end network (referred to as "pixels-to-actions"). This repository includes discrete Deep Q-Learning (DQN) and continuous A3G algorithms in PyTorch, examples and an interoperability library API in C++ for integrating with Linux applications in robotics, simulation, and deployment to the field. note: stream our webinar on the topic that follows this tutorial. During the cmake step, PyTorch will be compiled and installed so it can take awhile (around ~30 minutes to an hour on the Jetson). The stable version of PyTorch we are currently using is 0.3.0. The build script will download pacekages and ask you for your sudo password during the install. Before proceeding, to make sure that PyTorch installed correctly, and to get an introduction to PyTorch if you aren't already familiar, we have provided a Jupyter IPython notebook called intro-pytorch.ipynb that includes some simple PyTorch examples that verify the install and test the CUDA/cuDNN support in PyTorch. Now we have verified that PyTorch is loading, able to detect GPU acceleration, is able to allocate tensors on the GPU, and is able to perform basic tensor operations using CUDA. 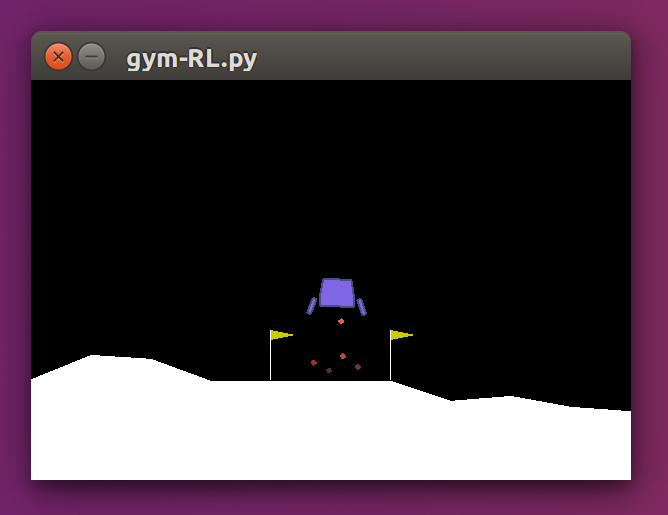 In order to first test and verify that the deep reinforcement learning algorithms are indeed learning, we'll run them inside OpenAI Gym environments (in 2D). As an introduction to the DQN algorithm, a second CUDA-enabled IPython notebook is included in the repo, intro-DQN.ipynb. This notebook applies the DQN on video captured from the Gym's CartPole environment, so it's learning "from vision" on the GPU, as opposed to low-dimensional parameters from the game like traditional RL. Although CartPole is a toy example, it's vital to start with a simple example to eliminate potential issues early on before graduating to more complex 3D scenarios that will become more difficult to debug, and since the DQN learns from a raw 2D pixel array it's still considered deep reinforcement learning. It's recommended to follow along with the notebook below to familiarize yourself with the DQN algorithm for when we transition to using it from C++ in more complex environments later in the repo. 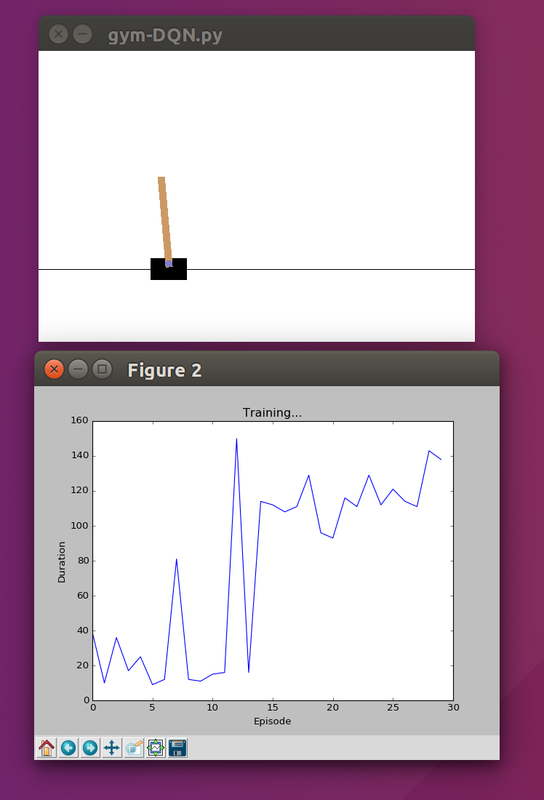 Three windows should appear showing the cartpole game, a graph of peformance, and the DQN agent should begin learning. The longer the DQN agent is able to balance the pole on the moving cart, the more points it's rewarded. In Gym, a score of 200 indicates the scenario has been mastered. After a short while of training, the agent should achieve it and the program will quit. Next, we'll look at integrating these standalone Python examples into robotics code via our C++ wrapper library. To take these deep reinforcement learners from monolithic Python examples into libray form that can be integrated with robots and simulators, we provide a C++ wrapper library and API to the Python code. Underneath, the library uses Python's low-level C FFI to pass the tensor memory between the application and PyTorch without extra copies (ZeroCopy). * Create a new instance of a module for training an agent. Included in the repo are different implementations of the agent, including dqnAgent which we will use in the simulation scenarios to follow. The user provides their sensor data, or environmental state, to the NextAction() function, which calls the Python script and returns the predicted action, which the user then applies to their robot or simulation. Next the reward is issued in the NextReward() function, which provides feedback to the learner from the environment and kicks off the next training iteration that makes the agent learn over time. To make sure that the reinforcement learners are still functioning properly from C++, some simple examples of using the API called catch and fruit are provided. Similar in concept to pong, in catch a ball drops from the top of the environment which the agent must catch before the ball reaches the bottom of the screen, by moving it's paddle left or right. Internally, catch is using the dqnAgent API from our C++ library to implement the learning. With 96x96 environment size, the catch agent achieves >75% accuracy after around 150-200 episodes. With 128x128 environment size, the catch agent achieves >75% accuracy after around 325 episodes. Next, we provide a 2D graphical sample in C++ called fruit, where the agent appears at random locations and must find the "fruit" object to gain the reward and win episodes before running out of bounds or the timeout period expires. The fruit agent has 4 possible actions to choose from: moving up, down, left, and right on the screen in order to navigate to the object. Note this C++ example is running mostly on the GPU, with the rudimentary 2D rasterization of the environment in CUDA along with the DQN, and the display visualization in OpenGL. Like before, it is learning "from vision" using to translate the raw pixel array into actions using deep reinforcement learning. An analog to more complex navigation and motion planning tasks, the simple fruit example intended to prove that the dqnAgent is able of visually identifying and navigating to objects of interest from any starting location. Later on in the repo, we will build on that path-planning capability in the 3D robotic simulations. When increasing the dimensions of the environment and pixel array input, the episode_max_frames should be increased accordingly, as the agent will require more time to get across the screen in a larger environment before the episode time-out. Up until this point in the repo, the environments have been 2D, namely to confirm that the deep RL algorithms are learning as intended. To migrate the agent to operating in 3D worlds, we're going to use the Gazebo robotic simulator to simulate different autonomous machines including a robotic arm and rover, which can then be transfered to the real-world robots. 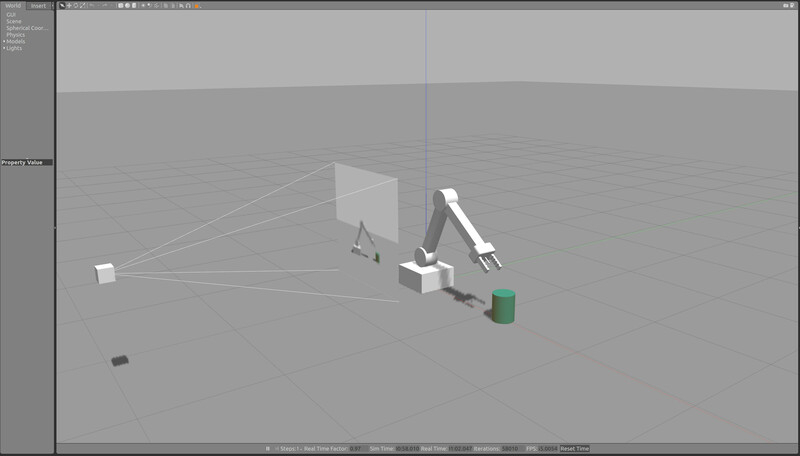 Our first Gazebo environment trains a robotic arm to touch objects without needing explicit IK (Inverse Kinematics). The plugins which hook the learning into the simulation are located in the gazebo/ directory of the repo. See ArmPlugin.cpp for the code that links Gazebo with the dqnAgent and controls the arm joints. Once you notice the arm agent converging on the object, you can begin to move the object around the scene by pressing T on the keyboard to enable Translation mode in Gazebo, and then by clicking and dragging the object around the viewport. Note that you will want to move the object so that the arm can still reach it, as the arm's rotational base is initially limited to around 45 degrees of travel in either direction. 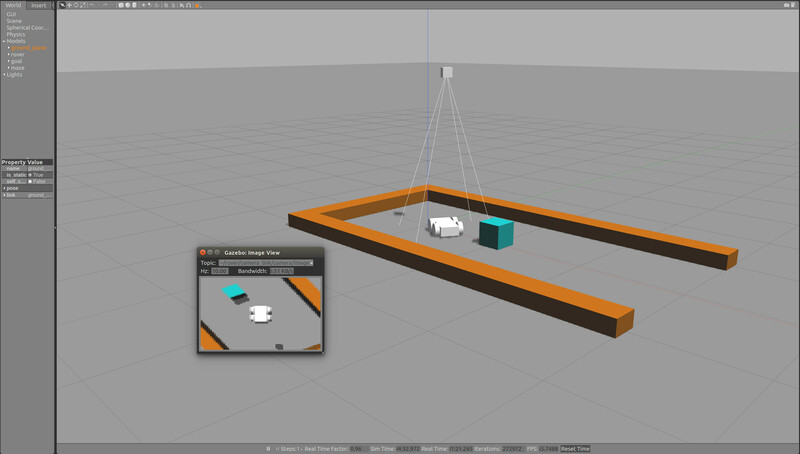 Press Ctrl+T and subscribe to the ~/camera/link/camera/image topic to visualize the scene from the camera. Similar to the arm, once you notice the rover consistently finding the object (in this case the green box), you can move the object around the scene by pressing T first. Note that there's an episode timeout similar to fruit, so you won't want to move the object too far away without first increasing the rover's maxEpisodeLength in the code and re-compiling. The DQN agent that we've been using is discrete, meaning that the network selects one output neuron per timestep, that the user then explicitly maps or defines to correspond to an action (typically increasing/decreasing a position or velocity by a delta amount). This means that for each degree of freedom in the robot, 2 outputs are required - one to increase the variable by the delta and another to decrease it. In more complex real-world scenarious it's often advantageous to control all degrees of freedom simultaneously and to have the network output the precise value of these variables. For example, if you wanted to teach a humanoid to walk (which can have 20-40 or more degrees of freedom), controlling all the joints simultaneously would be important to it's stability. For continuous control, there exists a class of more advanced deep reinforcement learners called Actor/Critic — an active area of research that's recently yielded the latest state-of-the-art solutions like DDPG, ACKTR, and A3C/A3G. Depending on settings and system resources, it typically takes A3G between 90-120 minutes to master the environment by clearing the hurdles and pitfalls. If you have multiple GPUs in a PC or server, you can disable rendering and increase the number of worker threads and specify additional gpu-ids to speed up training. By default, the repo builds with PyTorch and Python. However, there's also support included for Torch7 and LUA script with a compile flag. The process is scripted to automatically install dependencies like Torch7 and build the project from source. You may be required to enter the sudo password at some point. This will initiate the building of dependencies like Torch and it's bindings for CUDA/cuDNN, which can take some time. These scripts should run normally and verify the Lua / Torch environment is sane. the deepRL-console program can launch a user's script from the command line (CLI). Next, to verify that the reinforcement Q-learner learns like it's supposed to, let's play a simple game: half-pong, or catch. Each epoch is one game of play, where the ball drops from the top of the screen to the bottom. After a few hundred epochs, the Q-learner should be starting to catch the ball the majority of the time.